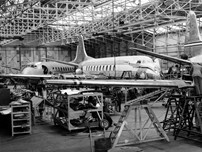 Below are the 40 photos we have on file for Viscount c/n 45 together with either the actual date that the photo was taken or an estimate of that date based on clues such as the livery worn or other background information. Delivered new to Trans-Australia Airlines (TAA) named as 'Gregory Blaxland'. Taken at Essendon Airport, Melbourne, Victoria, Australia 13 January 1956 with all engines running awaiting removal of the ground power unit. A large crowd has gathered outside the TAA terminal building to wave it off. Delivered new to Trans-Australia Airlines (TAA) named as 'Gregory Blaxland'. Taken at an unknown location in January 1956. Delivered new to Trans-Australia Airlines (TAA) named as 'Gregory Blaxland'. Taken at Essendon Airport, Melbourne, Victoria, Australia in January 1956. Delivered new to Trans-Australia Airlines (TAA) named as 'Gregory Blaxland'. Taken at Kingsford Smith Airport, Mascot, Sydney, New South Wales, Australia in April 1957. Note the revised direct vision (DV) cockpit window replacing the slatted type as part of an upgrade to V.720C standard. Delivered new to Trans-Australia Airlines (TAA) named as 'Gregory Blaxland'. Taken at Llanherne Airport, Hobart, South East Tasmania, Australia circa December 1957. Note the revised direct vision (DV) cockpit window replacing the slatted type as part of an upgrade to V.720C standard. Delivered new to Trans-Australia Airlines (TAA) named as 'Gregory Blaxland'. Taken at Kingsford Smith Airport, Mascot, Sydney, New South Wales, Australia in May 1961. Delivered new to Trans-Australia Airlines (TAA) named as 'Gregory Blaxland'. Taken at Eagle Farm Airport, Brisbane, Queensland, Australia in November 1963 in a later livery. Returned from Ansett-ANA lease. Taken at Essendon Airport, Melbourne, Victoria, Australia 13 August 1962 stored outside the ANSETT-ANA maintenance facility. Two months later ANSETT-ANA leased it again for a few weeks. Purchased from Trans-Australia Airlines (TAA). Taken at Kingsford Smith Airport, Mascot, Sydney, New South Wales, Australia in February 1964 with a weather radar system now installed. Purchased from Trans-Australia Airlines (TAA). Taken at Essendon Airport, Melbourne, Victoria, Australia circa June 1964. Peter braved the elements to get this great shot! Purchased from Trans-Australia Airlines (TAA). Taken at Essendon Airport, Melbourne, Victoria, Australia in September 1965. Purchased from Trans-Australia Airlines (TAA). Taken at Essendon Airport, Melbourne, Victoria, Australia in November 1965. Purchased from Trans-Australia Airlines (TAA). Taken at Kingsford Smith Airport, Mascot, Sydney, New South Wales, Australia in September 1966 being towed from the maintenance facility to the terminal building ready for another service period. Purchased from Trans-Australia Airlines (TAA). Taken at Kingsford Smith Airport, Mascot, Sydney, New South Wales, Australia in February 1967. Purchased from Trans-Australia Airlines (TAA). Taken at Parafield Airport, Adelaide, South Australia in July 1968. Leased from Ansett-ANA and named as 'R M A Quininup'. Taken at Perth Airport, Western Australia 14 September 1968 being repainted in MMA livery. Leased from Ansett-ANA and named as 'R M A Quininup'. Taken at Perth Airport, Western Australia in September 1968 now repainted in MMA 'Jetstream Service' livery. Leased from Ansett-ANA and named as 'R M A Quininup'. Taken at Perth Airport, Western Australia in November 1968. Leased from Ansett-ANA and named as 'R M A Quininup'. Taken at Perth Airport, Western Australia 8 November 1968. Leased from Ansett-ANA and named as 'R M A Quininup'. 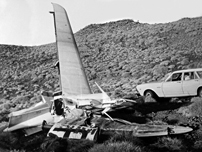 Taken at Perth Airport, Western Australia in December 1968, the same month that it crashed. Leased from Ansett-ANA and named as 'R M A Quininup'. Taken at Indee Station, 28 miles / 43 kilometers south of Port Hedland, Western Australia 31 December 1968. The sad remains of a wing, flap section and two Rolls-Royce Dart nacelles complete with Rotol propellers. Leased from Ansett-ANA and named as 'R M A Quininup'. Taken at Indee Station, 28 miles / 43 kilometers south of Port Hedland, Western Australia 31 December 1968. 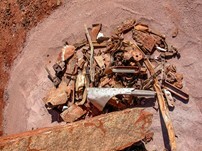 The crumpled remains of the No.1 (port outer) Rolls-Royce Dart engine and Rotol propeller. Leased from Ansett-ANA and named as 'R M A Quininup'. Taken at Indee Station, 28 miles / 43 kilometers south of Port Hedland, Western Australia 31 December 1968. The crumpled remains of the No.2 (port inner) Rolls-Royce Dart engine and Rotol propeller. Leased from Ansett-ANA and named as 'R M A Quininup'. Taken at Indee Station, 28 miles / 43 kilometers south of Port Hedland, Western Australia 31 December 1968. The crumpled remains of the No.3 (starboard inner) Rolls-Royce Dart engine and Rotol propeller. Leased from Ansett-ANA and named as 'R M A Quininup'. Taken at Indee Station, 28 miles / 43 kilometers south of Port Hedland, Western Australia 31 December 1968. The crumpled remains of the No.3 (starboard inner) Rolls-Royce Dart engine and Rotol propeller. Note the investigator in the background. Leased from Ansett-ANA and named as 'R M A Quininup'. Taken at Indee Station, 28 miles / 43 kilometers south of Port Hedland, Western Australia 31 December 1968. The crumpled remains of the No.4 (starboard outer) Rolls-Royce Dart engine and Rotol propeller. Note the outer wing section in the background still has ANSETT-ANA titles on it. Leased from Ansett-ANA and named as 'R M A Quininup'. Taken at Indee Station, 28 miles / 43 kilometers south of Port Hedland, Western Australia 31 December 1968. 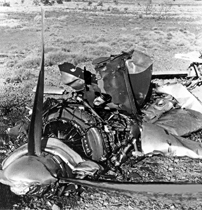 The crumpled remains of the No.4 (starboard outer) Rolls-Royce Dart engine and Rotol propeller. Leased from Ansett-ANA and named as 'R M A Quininup'. 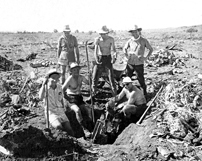 Taken at Indee Station, 28 miles / 43 kilometers south of Port Hedland, Western Australia 31 December 1968 after the crash. The sad remains of a wing section. Leased from Ansett-ANA and named as 'R M A Quininup'. Taken at Indee Station, 28 miles / 43 kilometers south of Port Hedland, Western Australia 31 December 1968 after the crash. The sad remains of an Rolls-Royce Dart engine and propeller. Leased from Ansett-ANA and named as 'R M A Quininup'. Taken at Indee Station, 28 miles / 43 kilometers south of Port Hedland, Western Australia 31 December 1968 after the crash. The sad remains of the tail and port tailplane. Leased from Ansett-ANA and named as 'R M A Quininup'. Taken at Indee Station, 28 miles / 43 kilometers south of Port Hedland, Western Australia 26 August 2004. 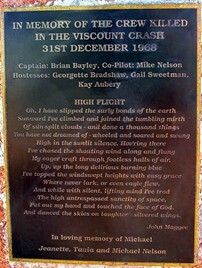 This memorial was erected near the crash site but sadly only lists the names of the five crew members. Leased from Ansett-ANA and named as 'R M A Quininup'. 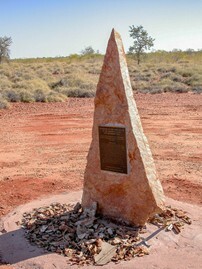 Taken at Indee Station, 28 miles / 43 kilometers south of Port Hedland, Western Australia 26 August 2004. A sad collection of airframe debris now placed near the memorial.